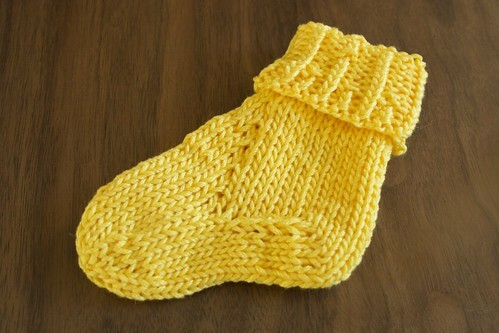 My first sock ever, knitted up as I start reading through Cat Bordhi’s New Pathways for Sock Knitters. Took me about five hours to complete, in some leftover yellow mercerized cotton. Learned some new techniques, which is always fun. Concealing the wraps was not as hard to grok as I had feared, but the wrapped stitches do appear to be larger or stretched, which is a little unfortunate. You can even see them in the picture above, at the edges of the heel.